As European policymakers and advocates increasingly express interest in developing managed, legal alternatives to the dangerous, unauthorized journeys many refugees undertake when searching for protection, there is a pressing need to inform the debate with reliable and comprehensive data—both on how protection seekers currently enter Europe and how new pathways are likely to be used. 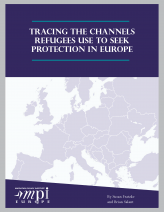 A plurality, and possibly a majority, of asylum seekers arrive in Europe via unauthorized channels. Refugees who receive protection after filing a spontaneous asylum claim outnumber those granted protection through resettlement or humanitarian admissions about ten to one. In Member States that make such data available, family reunification appears to be as important a channel for legal entry as asylum for individuals in need of protection. The report recommends that European governments seek agreement on how key humanitarian policies are defined and implemented. Without such common definitions, programs are not only difficult to evaluate, they also risk duplication or a lack of focus that can prevent them from achieving their fundamental aim of establishing safer and more orderly migration routes for the benefit of both protection seekers and the European societies that receive them. The authors further suggest that governments will need to invest in more detailed data collection and aggregation if they are serious about effectively implementing more legal channels to protection for refugees. No common European dataset exists to document the modes of entry or legal statuses of individual asylum applicants, and few if any Member States systematically report such data at the national level.